This is the FUN SECTION. Here's where you can take your ideas and turn them into finished projects. LOTS of stuff here. 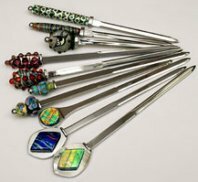 A useful gift item, these bright silver finish letter openers come in four different styles, including two that work well with your lampworked beads. 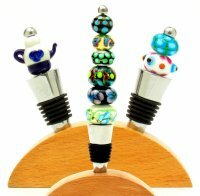 Perfect house warming or hostess gifts that you personalize with your hot glass creations. Styles to use with beads or fused cabochons.